The terms and conditions of the Celtic Rings Ltd web site. These Terms and Conditions are subject to change. Celtic Rings Ltd. reserves the right to update or modify these Terms and Conditions at any time without prior notice. Your use of the Celtic-WeddingRings.com web site following any such change constitutes your agreement to follow and be bound by the Terms and Conditions as changed. For this reason, we encourage you to review these Terms and Conditions whenever you use this Web site. These Terms are effective until terminated by Celtic Rings Ltd. Celtic Rings Ltd. may terminate these Terms without notice and at any time. In the event of termination, you are no longer authorized to access the Celtic-WeddingRings.com web site, and the restrictions imposed on you with respect to the Content, and the disclaimers, indemnities, and limitations of liabilities set forth in these Terms shall survive termination. Celtic Rings Ltd. shall also have the right without notice and at any time to terminate the Celtic-WeddingRings.com web site or any portion thereof, or any products or services offered through the Celtic-WeddingRings.com web site, or to terminate any individual's right to access or use the Celtic-WeddingRings.com web site or any portion thereof. All of the content you see and hear on the Celtic-WeddingRings.com web site, including, for example, all of the page headers, images, illustrations, graphics, and text are subject to trademark, service mark, trade dress, copyright and/or other intellectual property rights or licenses held by Celtic Rings Ltd., one of its affiliates or by third parties who have licensed their materials to Celtic Rings Ltd. The entire content of the Celtic-WeddingRings.com web site is copyrighted as a collective work under copyright laws, and Celtic Rings owns a copyright in the selection, co-ordination, arrangement and enhancement of the content. Celtic Rings has carried out specific enhancement and other qualitative techniques and processes in ensuring images of appropriate dimensions, file size and quality. No part, segment or piece of any photographic image or data, no matter how small, may be used or merged in connection with other images or artwork so as to create a new image. 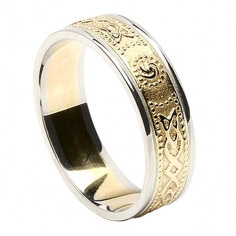 The content of the Celtic-WeddingRings.com web site, and the site as a whole, are intended solely for personal non-commercial use by the user’s of our site. You may download, print and store selected portions of the content, provided (1) no specific restrictions are displayed, (2) you only use these copies of the content for your own personal, non-commercial use, (3) do not copy or post the content on any network computer or broadcast the content in any media, and (4) do not modify or alter the content in any way, or delete or change any copyright or trademark notice. No right, title or interest in any downloaded materials is transferred to you as a result of any such downloading. Celtic Rings Ltd. reserves complete title and full intellectual property rights in any content you download from this Web site. You may not copy, download, reproduce, modify, publish, distribute, transmit, transfer or create derivative works from the content without first obtaining written permission from Celtic Rings Ltd. The user shall indemnify and keep fully indemnified Celtic Rings Ltd. from and against all actions, proceedings, claims, demands, costs (including any legal costs or expenses properly incurred and any compensation costs and disbursements paid by the user on the advice of their legal advisers to compromise or settle any claim), awards and damages arising directly or indirectly as a result of any breach by the user of any of the user's undertakings, warranties or obligations under the above conditions. Links to other Internet sites operated by third parties do not constitute sponsorship, endorsement, or approval by Celtic Rings Ltd. of the content, policies, or practices of such linked sites. Linked sites are not operated, controlled, or maintained by Celtic Rings Ltd., and Celtic Rings Ltd. is not responsible for the availability, content, security, policies, or practices of linked sites, including without limitation privacy policies and practices. Links to other sites are provided for your convenience only, and you access them at your own risk. Any hyperlinks to the Site from another Web Site must be presented in such a manner that the viewing of the Site is not impaired by framing or similar techniques that may impair the visitor's user experience. Use of Image tags (IMG or IMG SRC) to display images located on this site, on your own site, or a forum, is strictly prohibited without prior consent. 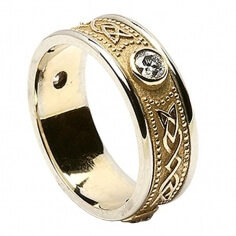 Prices displayed on the Celtic-WeddingRings.com site may be quoted in a range of currencies. Celtic Rings Ltd. may restrict delivery to addresses within certain geographical areas, as specified from time to time. Celtic Rings Ltd. will add shipping and handling fees and applicable sales/use tax. Celtic Rings Ltd reserves the right without prior notice to discontinue or change specifications and prices on products and services offered on the Celtic-WeddingRings.com web site without incurring any obligation to you. Products displayed on this site are available while supplies last. Descriptions of, or references to, products or services on the Celtic-WeddingRings.com web site do not imply endorsement of that product or service, or constitute a warranty, by Celtic Rings Ltd. The receipt by you of an order confirmation does not constitute Celtic Rings Ltd's acceptance of an order. Prior to Celtic Rings Ltd's acceptance of an order, verification of information may be required. 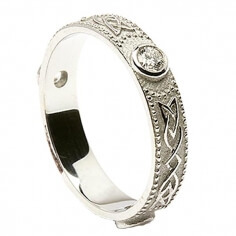 Celtic Rings Ltd. reserves the right at any time after receipt of your order to accept or decline your order, or any portion thereof, even after your receipt of an order confirmation from Celtic Rings Ltd., for any reason. Celtic Rings Ltd. reserves the right to limit the order quantity on any item and to refuse service to any customer without prior notification. 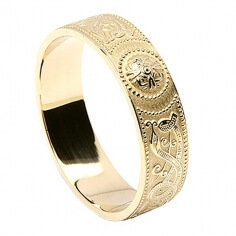 In the event that a product or service is listed at an incorrect price due to supplier pricing information or typographical error, Celtic Rings shall have the right to refuse or cancel orders placed for the product listed at the incorrect price, regardless of whether the order has been confirmed and your credit card charged. If your credit card has already been charged for the purchase and your order is cancelled, Celtic Rings shall promptly issue a credit to your credit card account in the amount of the incorrect price. 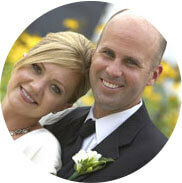 The Celtic-WeddingRings.com payment pages uses encryption technology to provide security of payments. SSL (Secure Socket Layer) transactions can take advantage of encryption technology. 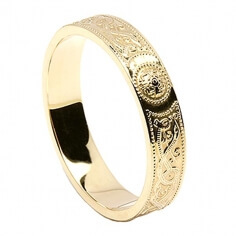 Celtic Rings Ltd. has taken precautions to ensure the security and confidentiality of the customer's transaction and cannot guarantee beyond this. The user agrees that the payment information provided by him may be held by Celtic Rings Ltd. and may only be given to payment partners (such as a bank) and only to any other party with the users express permission (save where the laws of the citizenship, domicile or residence of the user prohibit such information). Claims must be made within 15 days of receipt. Claims not brought within 15 days of receipt are excluded and no liability shall be accepted under any circumstances in respect of such claim. Users of this website expressly agrees that use of Celtic-WeddingRings.com web site is at the user's sole risk. Neither Celtic Rings Ltd., nor its affiliates, nor any of their officers, directors, or employees, agents, third-party content providers, merchants, sponsors, licensors (collectively, "Providers"), or the like, warrant that the Celtic-WeddingRings.com web site will be uninterrupted or error-free; nor do they make any warranty as to the results that may be obtained from the use of Celtic-WeddingRings.com web site. Whilst every effort has been made to ensure the accuracy of the information and material contained on the Celtic-WeddingRings.com web site, Celtic Rings Ltd, its directors, employees or agents assume no responsibility for and give no guarantees, undertakings or warranties concerning the accuracy, completeness or up to date nature of the information provided on the Celtic-WeddingRings.com web site or service, or merchandise provided through the Celtic-WeddingRings.com web site and does not accept any liability whatsoever arising from any errors or omissions. 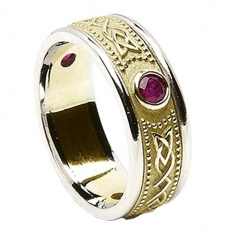 THIS SITE IS PROVIDED BY CELTIC RINGS LTD. ON AN "AS IS" AND "AS AVAILABLE" BASIS. CELTIC RINGS LTD. MAKES NO REPRESENTATIONS OR WARRANTIES OF ANY KIND, EXPRESS OR IMPLIED, AS TO THE OPERATION OF THE SITE, THE INFORMATION, CONTENT, MATERIALS OR PRODUCTS, INCLUDED ON THIS SITE. TO THE FULL EXTENT PERMISSIBLE BY APPLICABLE LAW, CELTIC RINGS LTD. DISCLAIMS ALL WARRANTIES, EXPRESS OR IMPLIED, INCLUDING BUT NOT LIMITED TO, IMPLIED WARRANTIES OF MERCHANTABILITY AND FITNESS FOR A PARTICULAR PURPOSE. CELTIC RINGS LTD. WILL NOT BE LIABLE FOR ANY DAMAGES OF ANY KIND ARISING FROM THE USE OF THIS SITE, INCLUDING BUT NOT LIMITED TO DIRECT, INDIRECT, INCIDENTAL PUNITIVE AND CONSEQUENTIAL DAMAGES. NO ORAL ADVICE OR WRITTEN INFORMATION GIVEN BY CELTIC RINGS LTD. NOR ITS AFFILIATES, NOR ANY OF THEIR OFFICERS, DIRECTORS, EMPLOYEES, AGENTS, PROVIDERS, OR THE LIKE, SHALL CREATE A WARRANTY; NOR SHALL USER RELY ON ANY SUCH INFORMATION OR ADVICE. Celtic Rings Ltd. will accept no liability or responsibility for any loss or damage arising as a consequence of delayed delivery or non-delivery of orders. Under no circumstances shall Celtic Rings Ltd., its suppliers or their respective directors, officers, employees or agents or any other party involved in creating, producing, or distributing the Celtic-WeddingRings.com web site be liable for any direct, indirect, incidental, special, or consequential damages that result from the use of or inability to use the Celtic-WeddingRings.com web site, including but not limited to reliance by a user on any information obtained from the Celtic-WeddingRings.com web site or that result from mistakes, omissions, interruptions, deletion of files or email, errors, defects, viruses, delays in operation or transmission, or any failure of performance, whether or not resulting from acts of God, communications failure, theft, destruction, or unauthorized access to Celtic Rings Ltd.'s records, programs, or services, whether or not damages are based on statute, contract, tort, or any other legal cause, and whether or not Celtic Rings Ltd is advised of the possibility of such liabilities. Users of the Celtic-WeddingRings.com web site hereby acknowledge that this paragraph shall apply to all content, merchandise, and services available through the Celtic-WeddingRings.com web site. Because some countries and states do not allow the exclusion or limitation of liability for consequential or incidental damages, in such countries and states liability is limited to the fullest extent permitted by law. 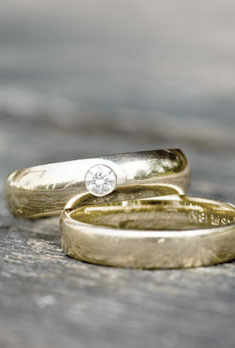 We welcome your comments regarding the Celtic-WeddingRings.com web site. However, any comments, feedback, notes, messages, ideas, suggestions or other communications (collectively, "Comments") sent to the Celtic-WeddingRings.com web site shall be and remain the exclusive property of Celtic Rings Ltd. Your submission of any such comments shall constitute an assignment to Celtic Rings Ltd of all worldwide rights, titles and interests in all copyrights and other intellectual property rights in the comments. Celtic Rings Ltd. will be entitled to use, reproduce, disclose, publish and distribute any material you submit for any purpose whatsoever, without restriction and without compensating you in any way. For this reason, we ask that you not send us any comments that you do not wish to assign to us, including any confidential information or any original creative materials such as stories, product ideas, computer code or original artwork. We have done our best to display as accurately as possible the colours of the products shown on the Celtic-WeddingRings.com website. However, because the colours you see will depend on your monitor, we cannot guarantee that your monitor's display of any colour will be accurate. You agree to defend, indemnify, and hold harmless Celtic Rings Ltd., Celtic Rings Ltd.'s vendors, and their affiliates and related entities and their respective directors, officers, employees, and agents from and against all claims, losses, damages, liabilities, and costs (including but not limited to reasonable attorneys' fees and court costs), arising out of or relating to your breach of these Terms or your access to or use of the Celtic-WeddingRings.com website. The foregoing indemnification obligation shall survive termination of these Terms and the Celtic-WeddingRings.com web site and any product or service provided to you arising out of or relating to your use of the Celtic-WeddingRings.com web site. Celtic Rings Ltd. shall not be liable for any non-performance or delay in performance caused by any act beyond its reasonable control, including but not limited to acts or omissions of third parties, unavailability of supplies, equipment failure, war, strikes, lock-outs, fire, flood, or any other Act of God, any law, regulation, ordinance, or other act or order of any court, government, or governmental agency, or delays, unavailability, errors, or other failures of the Internet or other data networks. Any disputes, claims or proceedings arising out of or in any way relating to the Celtic-WeddingRings.com web site shall be governed by the laws of Ireland. The Irish Courts shall have exclusive jurisdiction for the purpose of any proceedings arising out of or in any way relating to the Celtic-WeddingRings.com web site. Without prejudice to the foregoing, Celtic Rings Ltd. may seek provisional or protective relief in the courts of another State prior to, during or after any substantive proceedings have been instituted in Ireland and Celtic Rings Ltd. may bring enforcement proceedings in another state on foot of an Irish judgment. If any provision of this Agreement is found to be invalid by any court having competent jurisdiction, the invalidity of such provision shall not affect the validity of the remaining provisions of this Agreement, which shall remain in full force and effect. No waiver of any term of this Agreement shall be deemed a further or continuing waiver of such term or any other term. If you have any questions concerning our Terms and Conditions, then feel free to contact us at sales@celtic-weddingrings.com.